We’ve all seen AV rooms with gear jammed into racks with cables everywhere and acoustical treatments placed in ways that only a recording engineer could love. This is the makings of a divorce more than its the basis of great audio or home theater experience. 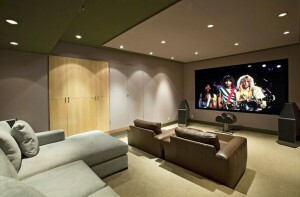 Publisher, Jerry Del Colliano of HomeTheaterReview.com (http://hometheaterreview.com/) took a different approach with his dedicated home theater system. While packing equipment neatly organized in a Middle Atlantic AXIS rack and connected with Transparent Audio cables – Del Colliano’s room also slickly hides 48 RPG “BAD panels” and 2 RPG Modex bass absorption plates behind a “whisper wall” fabric wall system. This stadium seat theater packs a 7.1 sound system, Classe electronics and a new set of Paradigm S8 speakers but also is professionally tuned by acoustician, Bob Hodas. Many lessons can be learned from the HomeTheaterReview.com theater including how to keep a double rack cool with incoming cool air and exhaust fans. The effect of video calibration on the JVC RDS-2 projector by Kevin Miller of the ISF is also of note as many home theater enthusiasts can benefit from a modest video calibration for their projection system. To learn more about this theater and or to read up on home theater educational articles (http://hometheaterreview.com/home-theater-education/) check out the resources that HomeTheaterReview.com has to offer for you. Everything from HDMI to Aspect Ratios to Home Theater Seating to Audiophile Topics are explained in professionally written prose.